Source of the text and sheet music is Richard Leighton Greene, The Early English Carols (Oxford at the Clarenden Press, 1935), p. 92. See also John Richard Magrath, The Queen's College. Volume II (1646-1877) (Oxford at the Clarendon Press, 1921), pp. 241-242. Before dinner on Christmas Day the Boar's Head is brought in procession into the College Hall. At the hour appointed the Provost and Fellows in residence, with any guests who may have been invited, enter the hall and arrange themselves on the east side of the high table facing the door. Grace before meat is said and the trumpet sounded in each quadrangle as a summons to dinner. Caput apri defero, Reddens laudes Domino. When thus bedeck'd with a gay garland. Sheet Music from John Richard Magrath, The Queen's College. Vol. 1 of 2 (1341-1646) (Oxford at the Clarendon Press, 1921), pp. 240-241. The "Boar's Head Gaudy" is now celebrated at the College on a Saturday just before Christmas each year for selected "Old Members" of the College. 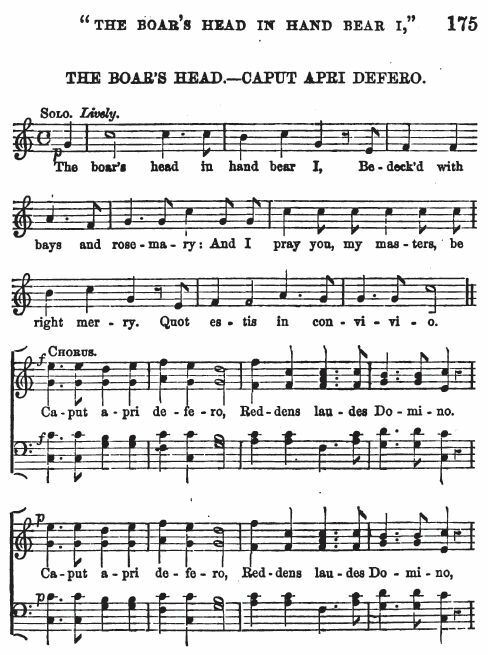 The version which is apparently sung today is the same as given above with one exception. The third line in the first verse is "And I pray you my masters be merry." The addition is the word "my." This version is also printed by Richard Leighton Greene, ed., The Early English Carols (Oxford at the Clarendon Press, 1935), Carol #132. C(a), p. 92. 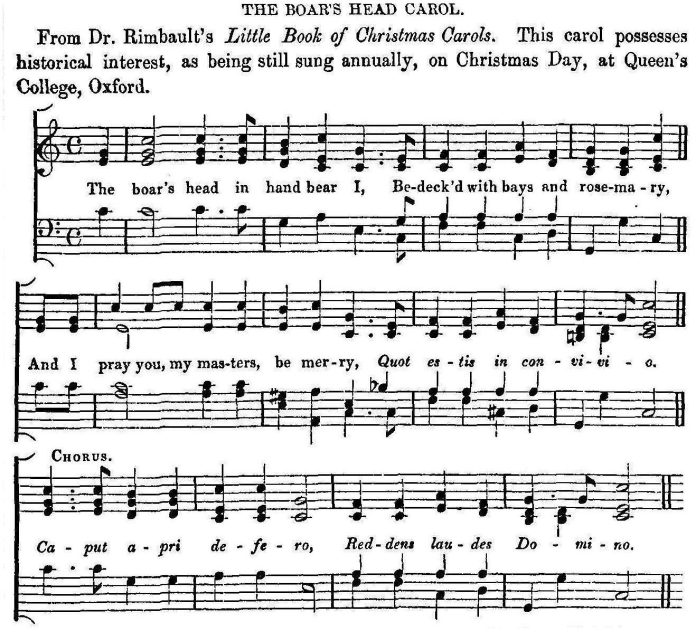 Note by Greene concerning Number 132, A Carol Bringing in the Boar's Head, p. 379. C. Printed. With music, Magrath, J. R., The Queen's College (Oxford, 1921), vol. ii, pp. 249-1; &c. On this, the Queen's College, Oxford, version, see Introduction, pp. lviii, cvi. It is more likely that the college adopted a well-known carol from popular circulation, then, that a carol originating in the college gained currency of the kind indicated by No. 135 and [Richard] Hill's and Wynkyn de Wood's recordings. 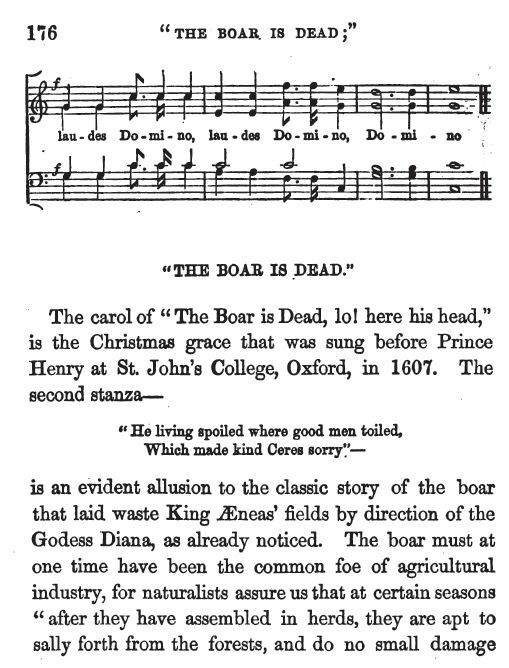 Note by Greene concerning the Boar's Head carols in his Introduction, Chapter II, "The Carol as Dance-Song," pp. lvii-lviii. Context. Section 3, "The Carol surviving the Dance." Greene is discussing to what extent many of these carols were still dance-songs, with the conclusion that most after the middle of 1500 were songs with an overtone of dance. Many of these songs were written in either two or three parts. The carols as written in these manuscripts are plainly songs to be sung in company, but not to be danced to. Yf he con non we schall hym lere. The companionship of the dance remained associated with the form of verse which had the dance-song for its pattern, even when the singers no longer stepped 'hand by hand'. Note 2. No. 133, burden and stanza 1. Ibid., p. 22. Context: Greene is discussing the lack of variation in some versions of carols due to the fact that their source is a written text “with no dependence on oral transmission and the consequent lapses of memory and perversions of meaning” (especially of the Latin portions of originally macronic carols), citing the carol Amice Christi Johannes. Editor's Note. 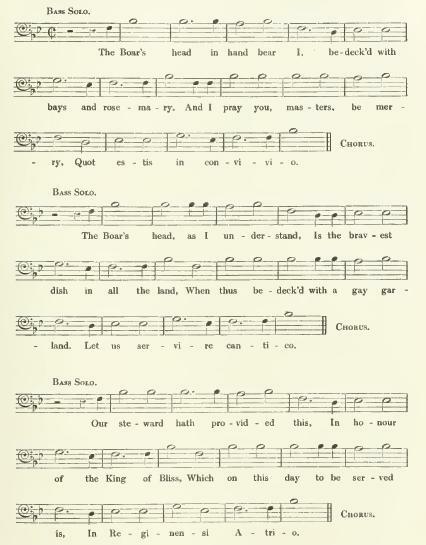 The “B” and “C b” carols are found in the main text of the book. They are Carol #132.B and Carol #132.C.b., pp. 91-92. The third stanza in the early version probably represents a corruption of a text which was originally in tail-rime like the other stanzas and after which the traditional Queen's College version is patterned. A circumscribed tradition such as this, from which the irresponsibility of folk-singers is entirely absent, is what seems to lie behind most of the carol-variants. 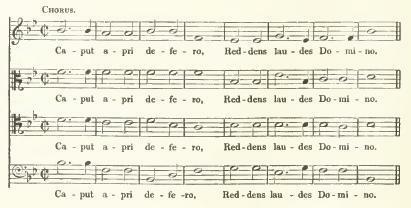 The generally excellent state of the Latin in different copies of macronic carols shows that they had not been loosed into truly popular oral tradition, which would have lost no time in reducing passages in the unknown tongue to gibberish, or in replacing them by vernacular lines, probably irrelevant. More than just a song, this is a carol sung by a young scholar whose cool and courage have inspired generations of students at Queen's College, Oxford. It appears that at some time in the 15th century, a man of learning was walking from the direction of Oxford towards Horspath village, where he proposed to attend Mass on Christmas morning. The old road from Oxford to London, from which you diverge a little to the south to reach Horspath, runs over Shotover Common, which is still an open space on (relatively) high ground. The scholar, whose name has come down to us as Copcot, was reading Aristotle while he was walking, and looked up to see a wild boar approaching him. He overcame the beast by stuffing his Aristotle down its throat – a triumphant victory of the academic over the brutish. With superb nonchalance he severed the head, carried it on his staff to church, left it in the church porch during the service, and took it back to College for dinner. Boars were a natural hazard in those parts that time, as we remember from the name of Boar's Hill, which stands over against Shotover on the other side of the Isis River. The episode is commemorated in a window in the parish church of Horspath. Source: Eric Routley, The English Carol (New York: Oxford University Press, 1959), pp. 39-40. From John Magrath, we learn that in the common-room gallery of the College is an oil-painting commemorating the victory of the brave young scholar, with a boar's head transfixed on a spear, and the mystic inscription beneath:—" COPCOT." Additionally, in the 1870s it was recorded by Karl Blind that a bust of Aristotle adorned the large fireplace in the College Hall. And so the scholar slays the savage with the sage. See: John Richard Magrath, The Queen's College. Volume II (1646-1877) (Oxford at the Clarendon Press, 1921), pp. 241-242, and Karl Blind, "Boars Head Dinner at Oxford, and a Germanic Sun-God, " in John Nichols, ed. The Gentleman's Magazine and Historical Chronicle, Volume 242. (R. Newton, 1877), pp. 96-108. However unlikely it might seem, there is a version of this legend that features a sword, rather than the sage, as the instrument that slayed the savage. See Tidings I Bring You For To Tell (Husk, 1868). I strive but to honor the feast of Coll. Reg. Derry down, down, down, derry down. Though we honor a boar, we wont make ourselves swine. Our motto displays both his valor and wit. That the stoutest of boars could not save his own bacon. He ramm’d in a volume, and cried — Græcum est. That logic’s the bulwark of body and mind. Learn Greek, and seek glory from hunting the boar. Source: William Hone, The Every Day Book, 2 Vols. London: William Tegg, 1825, 1827 (Volume 1, 1825, December 25). 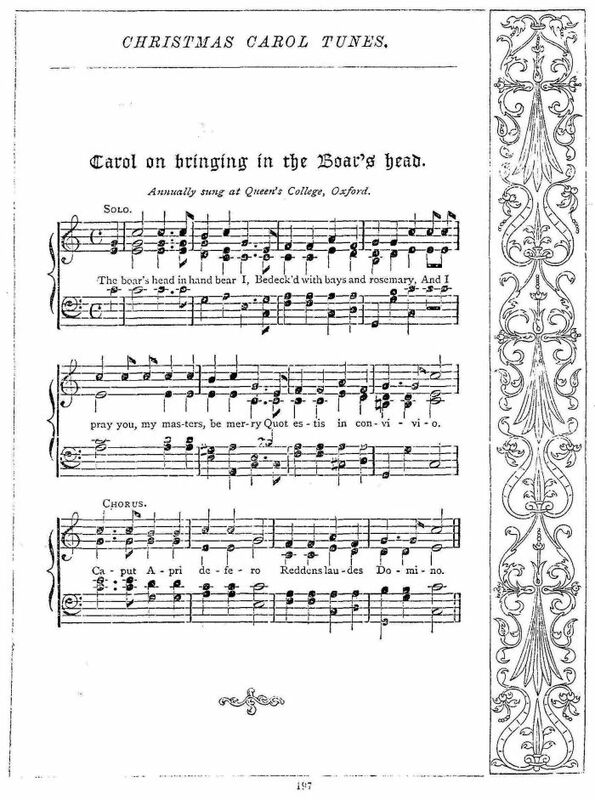 This carol is found on his page for December 25 - The Nativity of Christ: The Boar's Head.